Abstract: The sedimentary record of the Silurian-Devonian (Pridoli–Lochkovian) boundary interval was assessed using eight sections, which essentially represent two different environments and facies types. The local predominance of bioclastic packstones to grainstones indicates the presence of relatively shallow marine environments, between the upper carbonate slope and lower subtidal. The thickest limestone beds show locally wave ripple-bedding structures, erosional surfaces, and hardgrounds with accumulated angular lithoclasts; these features may have been markers of deposition above the storm wave base level. Slightly beneath these environments, the irregular rhythmites of the upper slope contain erosional channels, which are also frequently associated with hardgrounds. Here, the debris-flow material fills braided-channel systems and contains various clasts from the slope. Rhythmites deposited in relatively deeper water are dominated by platy limestones: bioclastic and peloidal wackestones, mudstones. They represent typical lower fan calciturbidites interbedded with basin-floor mudstones and shales. Very thin-bedded distal calciturbidites occur here frequently. Normal-graded calciturbidite beds with horizontal lamination and current-ripple bedding have large proportions of Tc and Td units of the Bouma sequence, the indication of lower flow-regime deposition. Calcareous shale interbeds represent background hemipelagic sediments (Tep-Tet). Occurrences of several meters thick layers composed of coarse-grained proximal calciturbidites with submarine mass-flow conglomerates are typical of the lowermost part of the Lochkov Formation (Lochkovian). These deposits were accumulated near the carbonate shelfbreak and on adjacent parts of the slope. Abstract: Ultramafic cumulates of Medvednica Mts form mega-blocks in the ophiolite melange from the Zagorje-Mid-Transdanubian segment of the Sava Zone. The blocks consist of chromite-olivine cumulates and pyroxenites. The rocks crystallized in an open system under low pressure. Early crystallization of Al-Ti-chromite and Ti-edenite/pargasite indicate high oxygen fugacity hydrous parental magma. The Medvednica Mts ultramafic cumulates are analogous to plutonic rocks from recent immature island arcs. Subsolidus reactions indicate rapid exhumation with the final equilibration resembling prehnite-pumpellyite facies. The Medvednica Mts ultramafic cumulate sequence shows common features with the analogous sequence of the Bükk Mts ophiolites from NE Hungary and differ from analogues from the Vardar/Dinaric ophiolite belts. Mantle peridotites lacking overlying crustal members crop out in the Medvednica Mts and Kalnik Mts, and were cored in drill-holes. The peridotites range in composition from lherzolite via transitional harzburgite to depleted harzburgite. Lherzolite resembles abyssal peridotite and together with transitional harzburgites are akin to the peridotites from the South Sandwichs and Mariana arc–back-arc system. Depleted harzburgites are typical of fore-arc peridotites and are similar to the harzburgites of the Inner Dinaride Ophiolite Belt. Assuming that ultramafic rocks from the Zagorje-Mid-Transdanubian Zone were generated in a single oceanic domain, the South Sandwich arc-basin system appears as the most similar analogue. If it holds true, then these ultramafic rocks must have been derived from the Meliata-Maliac ocean domain and not from the Dinaric/Vardar strands as was previously thought. 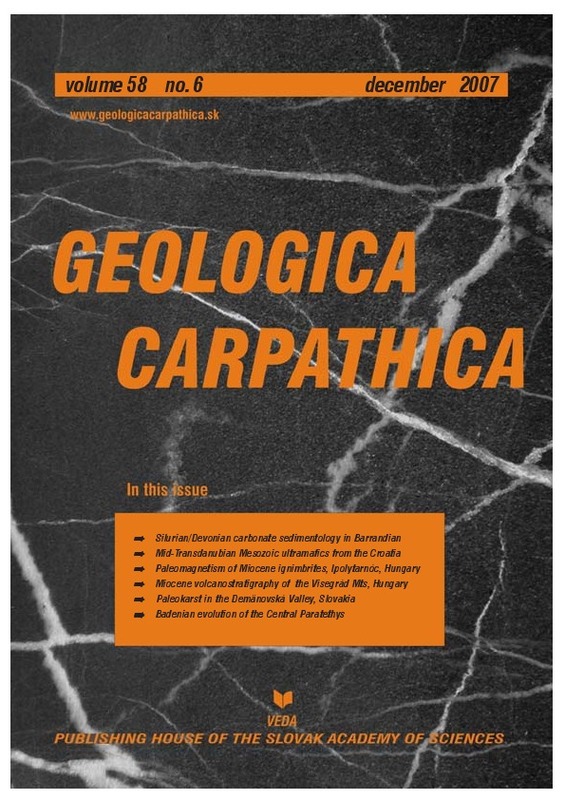 Abstract: On geological grounds, the ignimbrites/tuffs of the Ipolytarnóc area were regarded as belonging to the oldest of the three Miocene “tuff complexes” of the Pannonian Basin. From the paleomagnetic point of view, the three complexes are significantly different in the area which comprises North Hungary and South Slovakia, since the oldest is characterized by about 80º, the middle by about 30º counterclockwise, while the youngest about 10º clockwise rotation with respect to the present North. The significant differences in declinations are attributed to block rotations, which affected the area in the time intervals of 18.5–17.5 Ma and 16–14.5 Ma. Earlier, a pilot study on three ignimbrite sites from Ipolytarnóc indicated only 30º of counterclockwise rotation, which suggested that the volcanism was younger than assumed, while the underlying Eggenburgian sediments showed the expected large rotation. Following up indications, we carried out a detailed paleomagnetic study at this locality on a large number of samples from the terrestrial sequence which covers the Eggenburgian sandstone. These were the “footprint sandstone” and the overlying unaltered, ignimbrites which represent three volcanic cycles separated by clastic sediments. Ignimbrites from the surrounding area were also tested. The results obtained are of high quality, statistically well defined on the site level and are highly consistent on the between-site level. The polarity is normal for the first two cycles and reversed for the youngest. The rotation angle indicated is about 30º. Thus, we conclude that the ignimbrites at the Ipolytarnóc area are indeed younger than 17.5 Ma, so they belong to the “Middle Tuff Complex” of the Pannonian Basin. Abstract: A combined volcanological, petrographical, paleontological, radiometric and paleomagnetic approach to the Middle Miocene volcanism of the Visegrad Mountains, Hungary, constrains their eruptive activity. The volcanic evolution is divided into three stages on the basis of paleomagnetic data. The 1st stage andesitic to dacitic explosive eruptions occurred in a submarine environment ≥16 Ma. Their products show normal polarity and CCW declinations. Scattered extrusive dacitic activity closely followed ≤16 Ma into a reverse polarity stage. A more voluminous, subaerial, andesitic activity (16–15 Ma) produced a large variety of volcaniclastic rocks, mostly block-and-ash- and debris-flow breccias, and lava domes/flows accompanied by subvolcanic bodies. The main eruptive centre was the Keserűs Hill explosive lava dome complex. Within the andesitic activity, that partly overlapped the dacitic extrusive activity, two paleomagnetic stages can be defined. These indicate a CCW rotation within a reverse polarity stage, 15.5–15.3 Ma ago according to K/Ar data. All of the three paleomagnetic stages can also be found in the neighbouring Börzsöny Mts. At the same time, the latter is characterized by a subsequent final stage (with no rotation in the High Börzsöny lava dome complex) that is missing in the Visegrad Mts. With respect to paleomagnetism and the sporadic, uncertain K/Ar data <14.5 Ma, in the Visegrad Mts the main andesitic volcanism may have terminated 15–14.5 Ma. In the Börzsöny Mts, the buildup of the High Börzsöny (14.5–13.5 Ma) may have been coeval with only sporadic late-stage andesitic eruptions in the Visegrad Mts. Abstract: Lithified paleokarst turbidite deposits in Okno Cave, Demanovska Valley occur in cavities intersected by the main relict fluvial passages of the cave. The deposits show a degree of diagenesis not normally associated with lithified cave sediments with the development of spar-lined voids and diagenetic chalcedony. This indicates a period of post-depositional burial before their exposure in the walls of the present cave. The deposits indicate the existence of an ancient period of cave development and filling after the folding of the limestone but before the incision of the Demanovska Valley. This is likely to have taken place in the Paleocene. Abstract: The Miocene Central Paratethys Sea covered wide areas of the Pannonian Basin System, bordered by the mountain chains of the Alps, Carpathians and Dinarides. The epicontinental sea spread not only in the back-arc basin area, but flooded even the Alpine-Carpathian Foredeep, situated along the front of gradually uplifting mountains. The Early Badenian (early Langhian) transgressions from the Mediterranean toward the Central Paratethys realm, via Slovenia and northern Croatia (Transtethyan Trench Corridor or Trans Dinaride Corridor) flooded the Pannonian Basin and continued along straits in the Carpathian Chain into the Carpathian Foredeep. The isolation of eastern parts of the Central Paratethys at the end of this period (late Langhian) resulted in the “Middle Badenian” salinity crisis. Thick evaporite sediments, above all halite and gypsum were deposited in the Transcarpathian Basin, Transylvanian Basin and Carpathian Foredeep. During the Late Badenian (early Serravallian), the latest full marine flooding covered the whole back-arc basin and a great part of the foredeep. The main problem is to create a model of sea connections during that time, because some authors consider the western Transtethyan Trench Corridor (Trans Dinaride Corridor) closed and there is no evidence to prove a supposed strait towards the Eastern Mediterranean. A proposed possibility is a connection towards the Konkian Sea of the Eastern Paratethys. The Badenian climate of the Central Paratethys realm can be characterized as fairly uniform, reflecting the stable subtropical conditions of the Miocene Climatic Optimum. No considerable changes in terrestrial ecosystems were documented. Nevertheless, evolution of steep landscape associated with rapid uplift of the East Alpine and Western Carpathian mountain chains (including high stratovolcanoes) caused development of vertical zonation of dry land and consequently close occurrence of different vegetation zones in a relatively small distance during this time. In the Central Paratethys Sea a slight N-S climatic gradient seems to be expressed already from the Early Badenian, but a biogeographic differentiation between basins in the North and South starts to become more prominent first during the Late Badenian, when a moderate cooling of the seawater can also be documented. The Late Badenian sea-level highstand coincides with the appearance of stress factors such as stratification of the water column and hypoxic conditions at the basin bottom in the whole area. Taking into account all bioevents and changes of paleogeography in the Central Paratethys realm, we can very roughly correlate the Early (and “Middle”) Badenian with the eustatic sea-level changes of TB 2.3, TB 2.4 or Bur5/Lan1, Lan2/Ser1 and the Late Badenian with TB 2.5 or Ser2 cycles (sensu Haq et al. 1988; Hardenbol et al. 1998). Generally, we can assign the Early Badenian transgressions to be controlled by both, tectonics (induced mainly by back-arc basin rifting) and eustacy, followed by forced regression. The Late Badenian transgression and regression were dominantly controlled by sea-level changes inside the Central Paratethys realm.